If you want to read something that gives you chills, check out The Shallows by Nicholas Carr. No, this isn’t the script for the move about a surfer and sharks. It’s a book about the Internet and our brains – a different kind of thriller. I not sure how I missed reading the book when it first came out. It was a finalist for the 2011 Pulitzer Prize in nonfiction. Carr writes about reading, technology, and cognitive science – a sweet intersection of my interests. In case you missed it, I’m adding it to my growing list of Books for Writers: books that aren’t about writing, exactly, yet are still incredibly relevant for writers. Our brains are plastic, in that they change based on our behavior. A load of neuroscience research in recent decades backs up this assertion. The Internet has changed our behavior. (You only have to watch people on their phones in restaurants to confirm that fact.) Specifically, it changes the way that we read. When reading online, we skip around, browsing, clicking, and surfing. As a result, we spend less time in concentrated, linear reading, and more time deciding what to do next. Because our behavior affects our brains, it follows that the Internet is changing the way that we read on an internal level. Our brains restructure themselves according to how spend our time, and we spend time skipping around, reading in short bursts. Carr argues that in exchange for the many benefits of the Internet, we are trading away our ability to read with deep, linear thought processes. We are programming our brains for online surfing, and this has has serious implications for each of us – as readers and as writers. I am increasingly aware of my own tendency to skim when reading online. I click through to an interesting post, then gloss it over for key points, to see if it holds enough interest for deeper reading. I’m in a hurry to get to the next thing. I feel guilty, but there’s only so much time in the day. I have to hang out in the shallows. Back in the 1990s, my freelance writing clients regularly requested technical white papers between 10 and 12 pages in length. By 2012, a five-pager was considered long, even for technical content. Three pages is the new ten pages. This is true even when people need to read and understand a complicated topic. 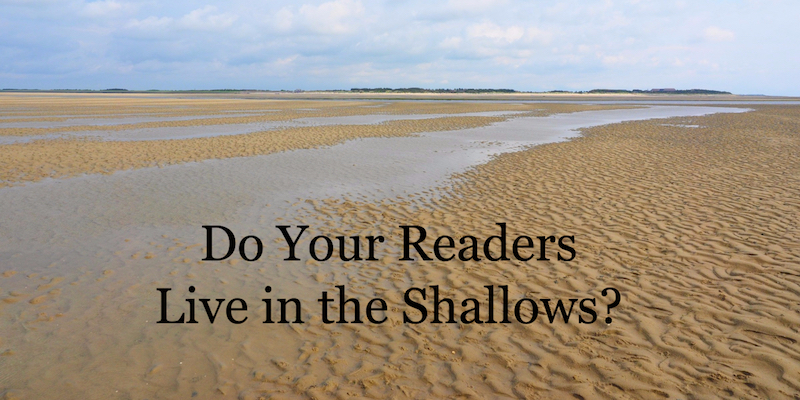 Our readers, like us, live in the shallows. This fact changes not only how long our content is, but even how we approach the work of writing itself. We write differently for readers with wandering attention. Without an attentive reader following our thoughts, we may keep our writing superficial. If we want to communicate effectively, we need to reach people where they are right now. If readers encounter your work online, remember the limits of their attention. Use short, concise sentences. Avoid large, uninterrupted blocks of text. Remember that only a select few things can earn your audience’s uninterrupted attention. A friend who subscribes to my email list told me recently that she keeps my weekly Wednesday posts in her inbox, to read at leisure on the weekend. That felt like high praise. Remember that concentrated reading time is rare and precious. The message of hope in all this is that the brain is shaped by our behavior. This means that we each have the opportunity to rewire our brains – even if the work of doing so is tough. To change your brain’s wiring, practice. If you think of yourself as someone who reads and thinks deeply, who can shut out distractions of the attention-seeking world, you have to practice that state. As a musician, I’ve seen what smart practice can do. I understand its power. The truth is, none of us can dive deeply on topic we encounter. The shallows are a safe place. But we can choose those times in which we choose leisurely, self-paced reading and protect them. In recent years, I have made a point to carve out more time for uninterrupted, self-pace, single-processing reading – reclaiming my deep reading neural processes. I savor this kind of reading more, now that I recognize its scarcity. If you haven’t yet read it, add The Shallows to your reading list. Then, take the time to sit and read it through thoughtfully. How about you – do you find yourself losing your ability to read deeply? Are you protective of your reading time? Let me know what you think.